What’s more impressive than having a high-end entertainment system within the comfort of your home? Imagine having a system that allows you to invite guests over for superior in-home entertainment, one that cranks up your holiday parties while you create lasting memories with family and friends. A home theater system that enables you to do things such as set-up cool themes and create a classy movie theater interior of your choice – creating the perfect ambiance for a home-based movie night. Suddenly popcorn and lazing around become the least of what you look forward to during these evenings of entertainment, as this technology enables you to transform your home into a high-end cinema. However, you may ask yourself - is it actually possible to have such a smart, reliable home theater system with the same video and audio quality of an actual theater? These are the most important speakers in the home theater system. 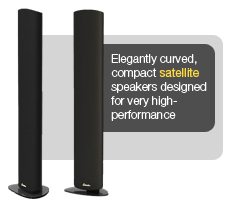 They can be anything from large Floor Standing Towers (Triton), to Bookshelf speakers (Aon), to On-Wall Satellites (SuperSat), or even In-Wall speakers Invisa). 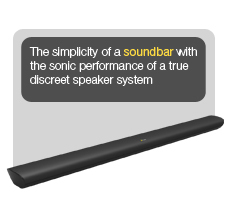 If there is no floor or wall space allowed for anything other than the TV then the passive Soundbar (3D Array) is your solution for these channels of your home theater. The Center Channel speaker, one of the hardest working speakers in a home theater system, must match the left and right speakers in sound quality and must be located above or below the TV. All these channels must be at Ear Level for the current object-based surround sound formats. Surround and Rear speakers are one of the key components to creating the fantastic immersive audio experience for great home theater systems. 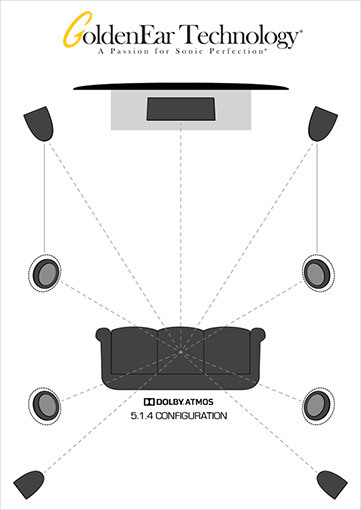 For most typical room sizes, only Surround speakers are suggested, although most home theater receivers now support both Surround and Rear channels, if desired. These channels must be located at ear-level to create the correct sound localization. In-Wall, On-Wall Satellite Speakers, Bookshelf Speakers or Floorstanding Towers are all viable for these channels. Height channel speakers are the other key component to achieving the immersive audio experience that a great home theater system can achieve. These speakers must be mounted in or on the ceiling, so in-ceiling speakers or in-ceiling speakers are required. Although two height speakers is the minimum, the recommendation is to have four, two back height and two front height, to properly create the localization of sounds. The most common configuration for a typical size home theater would be 5.1.4 (Five main channels: Left, Right, Center Surround Left, Surround Right – One Subwoofer channel – Four Height Channels: Front Left and Right Height, Rear Left and Right Height). The subwoofer is the anchor for a great home theater experience, providing all the low frequencies for every channel plus the movie effects that make it all seem real. The subwoofer adds the visceral impact to the experience, shaking your room when the explosions occur and filling in the weight of the music soundtracks. The general rule with subwoofers is MORE! 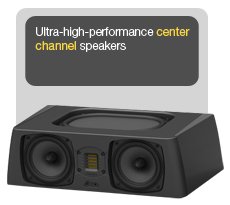 For the best performance, you will want at least two subwoofers, and the more powerful the better. The subwoofer will ultimately define the impact your home theater system achieves. 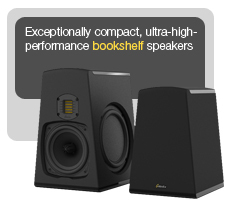 Goldenear offers a great selection of speakers to choose from for all of these applications. Today's home theater receivers have become the masters of everything, providing audio processing, source selection and typically multiple choices for streaming audio/video content. For audio processing, you will need an Atmos capable receiver with at least 7 channels of amplification (for a 5.2.1 system), and perhaps as many as 11. There are many great choices on the market today, offering lots of features and functions with surprising value. Want to take it to the next level? Look at a separate Processor and Power Amplifier combination. And of course a 4K Blu-Ray player is a must-have so you can feed your new home theater the highest quality source material. Why should you have to leave your home to enjoy high-quality video and audio that was formerly only available by visiting a large cinema? An incredible and easy to install home theater system (for you or your GoldenEar AV Integrator) is readily accessible to you, will likely look and sound BETTER than the multiplex cinema, and at a price that is much more affordable than most people realize. Wouldn’t you prefer to watch the movie of your choice, any time that you want? Pause when you want? Finish later if you want? Enjoy with just a small group of friends in the comfort of your own home? With on-demand movies and TV available at the touch of a button, research shows that more people are leaning towards investing in a home theater system, rather than visiting a cinema! Get in touch with us today if you’re interested in learning more about putting together the system that best suits your needs. 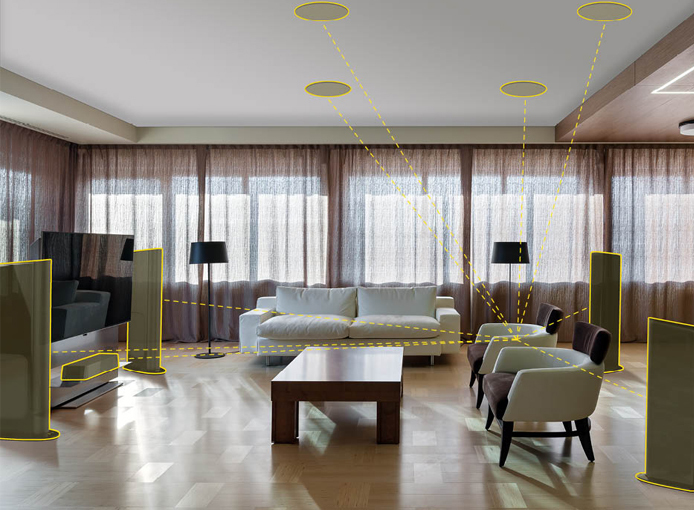 Did you know that specific positioning of your stereo system’s Floor-standing loudspeakers actually makes a significant impact on the quality of sound? Yes, this is true. Simply placing your speakers in the optimal location can immediately improve your room’s audio experience. There are some guidelines that you can follow to get the best sound quality out of your floor-standing loudspeaker. Let’s check them out! Each room is different and the resulting sound in a particular room is dependent on multiple factors, such as room architecture, i.e. size, shape, and structure. Furthermore, the contents and finishing of a room may also have an impact on the resulting sound. For instance, a room that is carpeted versus a room with wooden flooring, versus a room that is fully furnished compared with one that is relatively empty – the sound will vary greatly from one scenario to the next. Audio will translate quite differently in a sparsely furnished room with wooden, ceramic or laminate flooring, versus one with thick wall-to-wall carpet and oversized sofas. You can guess which would sound echo-y and hollow. In order to improve the sound, one might think about purchasing an expensive new audio component or cables. However, a slight re-positioning of the floor-standing loudspeakers placement may dramatically enhance the overall experience without spending a dime on new “stuff” for your audio system. Placing your floor-standing loudspeakers away from boundaries (walls) is always best. An appropriate distance would be around 3 ft (1m) from back and side walls. Less can be OK, and more is often better. As you pull them farther away from the walls you will get less “boundary gain”, which affects low frequencies. The reason for that is when loudspeakers are positioned too close to a wall, or in a corner area, the reflected sound is magnified. At the same time, you will get improved “spaciousness” to the sound. The basic relation of the speaker positions and the listener position forms a triangle. The sweet spot will be when the distance between the speakers (the “base” of the triangle) is equal to or more than the distance to the listener (the “height of the triangle). The two speakers should be equidistant from the listener and then toe each speaker in (aim them) to point at the center of the listening area, making sure that the toe-in is identical for both the speakers. This will result in the listening area being the “sweet-spot”. The idea behind it is that setting the distance between the speakers in such a manner will attain a balance between a wide soundstage and strong center-fill. The further that you place the speakers, the wider the soundstage will be and the better the system will sound for listeners, not in the center of the listening area. Who knew that placing speakers for best performance could be this easy? If you’re looking to invest in a superior sound system for your home, look no further than GoldenEar’s high-performance award-winning speakers. Want some advice from other users? Join our GoldenEar website community forum or contact us for more information. 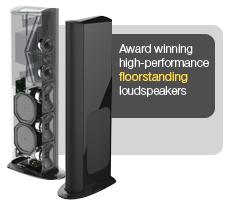 GoldenEar's CES 2015 New Product Introductions Were a Sensation! Triton FIVE - $999.99/ea (US) Passive Floorstanding Tower Was a CES Mega-Hit! The new SuperSub XXL was also a big hit, making a perfect match with the larger 3D Array XL soundbar, which looked perfect atop the 65" Sony 4K TV in our 5.1 theater setup. In fact, it sounded so good and blended so well, that one major reviewer (you'll see below) thought he was listening to Triton Ones instead of the 3D Array XL! To say people were blown away by the compact size and room shaking performance would be a huge understatement, as you'll see by the comments below. Take a few minutes to read through these highlights from the show postings and be sure to click on the article headings' links to read the full text of these amazing postings and reviews on the new Triton Five and SuperSub XXL. Don't miss them! After achieving success with 2013's passive Triton Seven mini-tower ($700 each) and last year's powered Triton One flagship ($2,500 each), GoldenEar Technology has plans to introduce another affordable passive tower, the Triton Five. Company founder Sandy Gross was on hand at CES 2015 to demo the system in a stereo pair ... They did sound spectacularly open and transparent, with a wide and deep soundstage on a variety of orchestral, jazz, and pop tracks. Among them was a CD rip-from-vinyl of a 1958 Buddy Holly recording of "True Love Ways" that was trotted out by our colleague Michael Fremer and nearly brought me to tears thanks to the tremendous detail the in Holly's close-miked vocal. A number of showgoers and even reviewers were observed leaving GoldenEar's room shaking their heads in disbelief that a speaker sounding this good could cost so little. That was the subject heading of an email that I received from GoldenEar's Sandy Gross back in November. These turned to be another tower speaker, the Triton Five ($1999.98/pair) and a new subwoofer, Super-Sub XXL ($1999.99 each). Listening to a pair of Fives, the resemblance to the One (and the Two) was quite obvious, with the same sort of precise imaging and excellent bass extension and impact. I was sitting in the GoldenEar Technology suite at the Venetian in Las Vegas on Sunday night, listening to the company's new Triton Five tower loudspeakers for the very first time, when my friend and colleague Darryl Wilkinson-along with me, one of the first people outside of the company to hear the new speakers-leaned over and whispered in my ear, "I'm running out of superlatives, man." I don't think either of us expected to be wowed by the (new) Triton Five. Congratulatory, sure. Impressed, absolutely. But not bowled away. In fact, in almost every respect, you can think of the Triton Five (as) a true child of the company's monolithic flagship (Triton One). GoldenEar set a new standard for the industry with the Triton One ... represents the measuring stick for GoldenEar itself. And when you account for the difference in price and the difference in size, the Triton Five definitely measures up. If I had $999 to spend on a new speaker (and didn't already have a pair of Triton Ones), I'm having trouble thinking of another speaker that would deserve a spot on the short list alongside the Triton Five. It's just that good. I found the extraordinary GoldenEar Triton Five loudspeakers on the morning of the first day! These new Triton Fives were a clear testament that Sandy and his design team really know what the audio world wants. The $1999.98/pair Triton Fives disappeared completely while playing music and, with their slender lozenge profiles and wrap-around grilles, they also looked extremely Dionysian! Maybe it was a trick of my mind, but these loudspeakers disappeared better than any I have ever heard-including electrostatics. The soundstage wasn't only deep and wide-it was big-and beautiful to behold. Unlike most other "disappearing" speakers, the Triton Fives retain a natural tone character and a tangible corporality. While the music was playing, I swear I could see nymphs and goddesses dancing about the soundstage. As we have by now come to expect from GoldenEar, the sonic whole of passive Triton Five is much greater than the apparent sum of its parts. How good is it? Let's just put it this way. First time listeners who had read our and other publications' reviews of the Triton One walked into the GoldenEar sound room and mistakenly concluded-purely on the basis of observed sound quality-that the Triton Five was surely the more than twice as expensive Triton One (itself a stunningly good value). As you can imagine, those listeners were stunned to learn they were in fact hearing the Triton Five, a loudspeaker that will sell for a tick under $2000/pair. The value for money on offer here is clear off the charts. It's kind of cliché at this point to say that GoldenEar Technologies' founder Sandy Gross has done it again, but things are cliché for a reason. While last year's CES saw GoldenEar introduce a new flagship in the form of the Triton One, this year Sandy introduced the Triton Five, a speaker that will retail for under $1,000/each. While the Fives don't include a powered subwoofer, you'd hardly know it by listening as the towers produced solid, deep bass notes you can feel resonate in your chest. As is typical of the other speakers in GoldenEar's line-up, the Triton Fives feature a high-velocity folded ribbon tweeter that plays airy, lifelike audio that just breathes music into the room, producing both a razor-focused center image and music that extends well beyond the confines of the speaker's cabinet. The latest from Sandy Gross' factory of low-priced marvels, the Triton Five, is unusually efficient. Give it just thirty watts and it's perfectly happy. At CES, the Five boasted GE's standard attributes of smoothness, tonal purity, and Quad-like coherence. As expected, bass was limited in extension, but it was tight and full of timbral detail. Listening to the Five inevitably means getting pulled into the music. "Sound this superb from $2000 speakers just isn't fair to the competition." When speaker designer and GoldenEar Technology founder, Sandy Gross, called me up to tell me his company's new Triton Five speaker was performing far better than expected. The consensus among the pros is that the entire Triton series is truly revolutionary. But the Triton Five? They absolutely rock the speaker world's foundation to its core. That a pair of speakers can sound this good for just $2,000 speaks volumes about their creators, and forces into question the current state of the high-end audio industry. GoldenEar Technology has a habit of impressing show attendees and this year's CES was no exception. The company's brand new Triton Five tower speaker ($999.99/each) made its debut at the Venetian Hotel in Las Vegas this week, and boy, did it make an impression. For our listening pleasure, Sandy put on a cut from Beck's latest album, "Morning Phase" in addition to his old standby demos like "Fanfare for the Common Man" by Copland. Both the classical piece and the rock track displayed excellent dynamics, that lush folded-ribbon midrange, and remarkably deep, extended bass for a fairly small tower speaker But more importantly, the blend of sound was entirely coherent from top to bottom. Sandy Gross demoed his new $1,999/pair Triton Five loudspeakers, and they sounded obscenely good. The flagship Triton Ones for $5,000 (which earned a spot on our Best of 2014 list) compete with speakers costing three times the price, but these $2,000 speakers were show-stoppers in their own right. Triton Five's Dual (per side) Passive RadiatorsSandy Gross flagged down our team in the hallway on setup day, before CES opened, to ask if we'd like to hear his company's new Triton Five speakers, which he'd just finished dialing in. I'd never listened to the Triton Seven closely enough to compare the Five to it, but I'm in the process of reviewing the Triton One right now. What most intrigued me in Vegas was how similar in character were the sounds of the Five and One: a smooth and exceedingly neutral midrange, effortless and extended highs, a wall-to-wall soundstage. The Fives' bass was also notable for its depth and power, which wasn't surprising -- all GoldenEar speakers produce deep bass, and sound big and full in ways that belie their modest prices. It was pretty obvious to me, and to others on our team, that Sandy Gross and GoldenEar have another winner on their hands. At this year's CES, Sandy was there in person to debut GoldenEar's newest creations. The Triton Five is a passive speaker design that relies on a pair of 6-inch mid-bass drivers and four passive radiators to create all of its bass output. GoldenEar incorporated refinements into the Triton Five that it derived from the Triton One development program. To my ears, the Fives embody everything I like about the GoldenEar sound-precise and transparent, without being harsh or analytical. A perfect rendition of "Morning" by Beck served as proof of the Five's prowess. What I heard coming out of the Triton Fives put a grin on my face. On first listen, the newest Tritons appeared to take everything that's great about the smaller (Triton) Sevens and elevate the recipe for their success to new sonic heights. Notably, there was no subwoofer in the system; the Fives produced all the bass that I heard on their own, and it was plentiful plus tight. Perhaps a little overwhelmed by all the attention for the new Triton Five, but the new top model from the forthcoming SuperSub line, the SuperSub XXL, got plenty of its own accolades. Here are a few excerpts from some of the highlights. GoldenEar Technology showed a prototype sub with a total of four drivers. They include two active drivers, firing from front and back; and two passive radiators, firing from top and bottom. This is said to neutralize cabinet resonance, and the demo proved it with strong, pure, controlled bass output. Have we mentioned the 1600-watt monster amp? Besides the wonderful new Triton 5 loudspeakers, GoldenEar was also demonstrating the new SuperSub XXL subwoofer. The sub has a 1600 watt Class D digital subwoofer amp that was developed from the Triton One. It has dual 12" ultra-long-throw high-output bass drivers and two 12-3/4" x 14-1/2" quadratic planar infrasonic radiators. The best part of this design is that the SuperSub XXL is inertially balanced. So what does that mean for you? Stability and performance! The subwoofer doesn't waste energy shaking the cabinet which would otherwise degrade performance. In fact, the SuperSub XXL cabinet is so stable that we were able to balance a nickel on its edge while the subwoofer was playing tons of deep, loud, detailed bass. At $1,999, this is a bargain for a subwoofer of this performance. The SuperSub XXL will be available later this year. On the other side of the hall at The Venetian, GoldenEar set up a SuperSub XXL along with a 3D Array XL speakerbar. A pair of Triton Ones were in the same room, but they were not in use. I must confess, at first I mistook what I actually heard-the 3D Array XL plus the SuperSub XXL-for the Triton Ones. 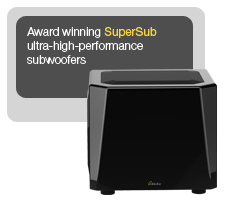 The SuperSub XXL ups the ante down low-no other GoldenEar product digs deeper into the infrasonic realm. 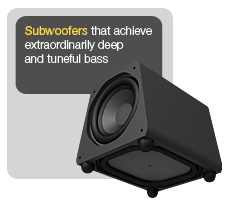 The SuperSub employs two 12-inch drivers in a dual opposed configuration. Additionally, it features a pair of passive radiators-also in a dual opposed configuration-that increase the SuperSub's output at the lowest frequencies while keeping the cabinet relatively compact. The driver pairs-by the very nature of the sub's design-cancel out unwanted vibrations. A nickel resting upright on the Supersub's smooth piano gloss surface provided undeniable proof that it was free of distorting vibrations. While it certainly is not cheap, the Supersub XXL is a remarkably powerful yet compact sub that-to my ears-blended perfectly with GoldenEar's 3D Array XL-the combination of was sonic bliss. Even while playing bass-heavy movie clips from The Art of Flight and Transformers: Dark of the Moon, the nickel stayed in place-despite the SuperSub XXL's prodigious output. Dolby’s Atmos® technology has re-energized the home theater world with the addition of true, discrete, overhead height channels. When properly executed, Atmos technology is capable of improving the three-dimensional imaging of almost any home theater system. However, when added to a great home theater system, like those built around GoldenEar speakers which already deliver fantastic three-dimensional imaging, Atmos can truly help take the listener into an exciting new world of lifelike, you-are-there reproduction experiences. 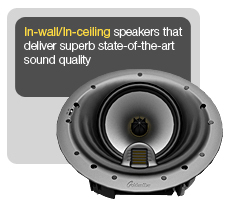 The new Invisa Home Theater Reference In-Ceiling speakers are now shipping and early reports are that they are AMAZING! So, I wanted to give you a few set-up and installation tips to insure you get the same great results. First, I would suggest that you start with the tweeter level switch in the "+" position. As you know, the ideal tweeter level on this kind of speaker is very variable depending on room acoustics, positioning and personal taste. I would suggest starting there and then adjusting to taste. 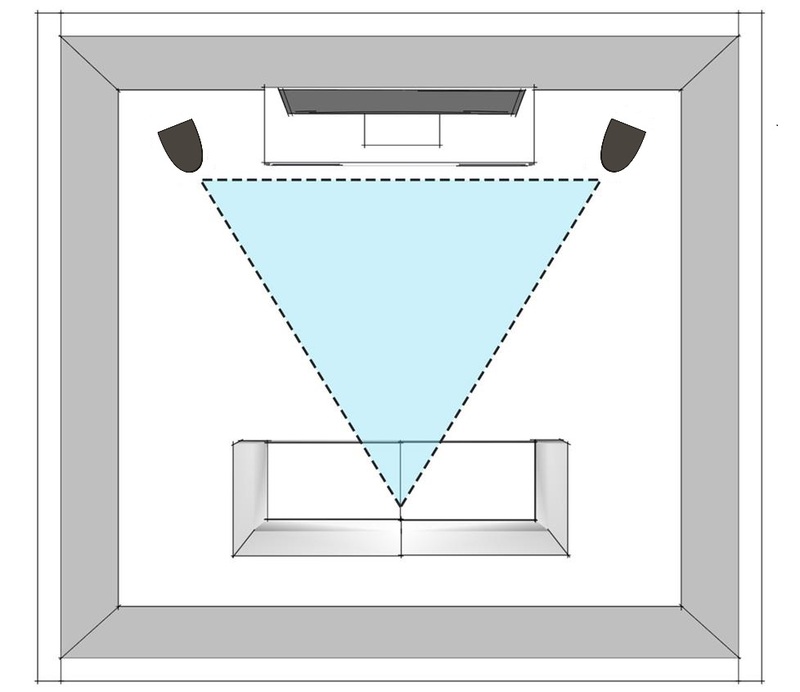 Second, you can, and should, rotate the Left and Right HTR 7000s in the ceiling so that they point at the central listening position (as we suggest for our freestanding speakers), as shown in the Owners Manual diagram (see below). This will give you the widest possible ideal listening area.